The San Diego Derby United Youth League is San Diego’s finest and first junior roller derby league! 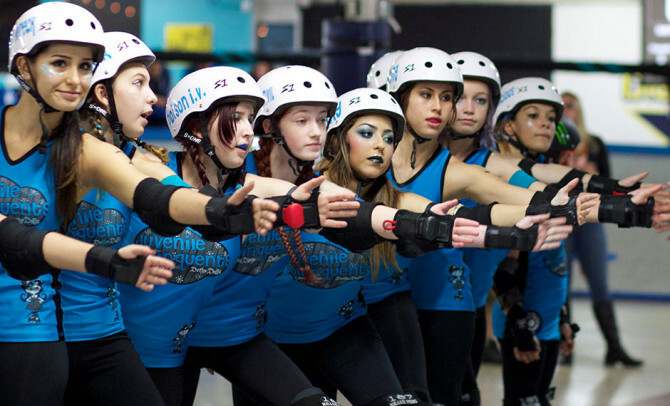 The junior skaters, ages 7-17, learn and play the game of banked and flat track roller derby. Juniors are enrolled year-round through monthly orientations. Learn more about the Junior Bootcamp training program. All new skaters join through the Junior Bootcamp program. Transfer, returning and experienced derby skaters may sidestep Bootcamp with a skills evaluation. Once enrolled, prospective members will receive their membership free of charge for the remainder of the month during which they attended orientation and filled out paperwork. All memberships are paid via autopay on the online Member Portal on the 1st of every month. Junior membership is month-to-month and may be canceled at any time (with 2 business days notice for cancellation to take effect). Details may be found in the Roller Derby 360 Membership Agreement. No experience is needed to join San Diego Jr Derby United. There are no try-outs for Junior Bootcamp. Just come to orientation and hear all about how the program works. Note: Gender is self-identified. Skaters may join the version and composition of roller derby roller team with which they most closely identify. Find out answers to most of your orientation questions here: Junior Bootcamp orientation F.A.Q. Ready to find out more? Fill out the form below to sign up for orientation.